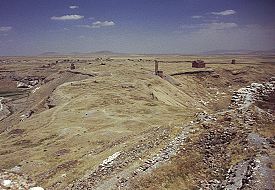 At the southern end of Ani the ground rises up to form a flat-topped hill. 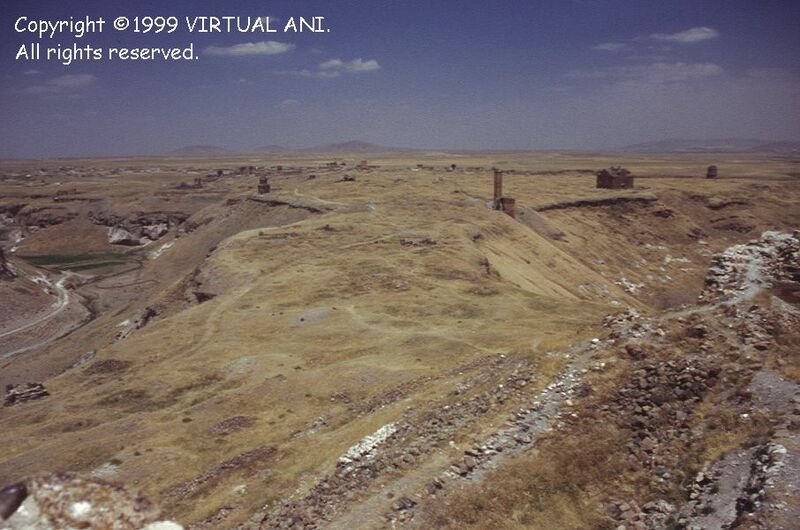 This part of Ani is known as the "Inner Fortress" (Midjnaberd in Armenian), or simply as the "citadel". As well as having natural defences of steep cliffs on three sides, the citadel was encircled by a single line of ramparts. This wall had towers on its north facing section, and an entrance gateway at its north-western corner. 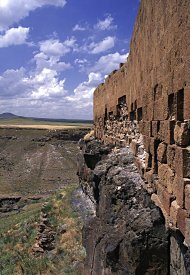 The citadel ramparts are presumed to date, in part, from the time that the Kamsarakan dynasty ruled Ani (the seventh century AD), but additional work was done on them until the thirteenth century. 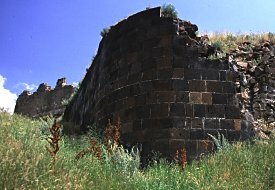 The entrance to the citadel, at [a] on the plan, was constructed at the time of the Sheddadid rulers of Ani (1072-1199) according to Nikolai Marr, and was joined to older walls. This gateway has a ramp up to it, paved with large slabs of stone. Underneath the gateway, but above the original ground level, Marr discovered the clay pipes of a conduit that had delivered water into the citadel. This water had come from a spring situated nearly eleven kilometres from the city. The citadel has no natural water supply. The rectangular tower [b] that flanks the gateway on the left is built from reused masonry: large stone blocks of black basalt. 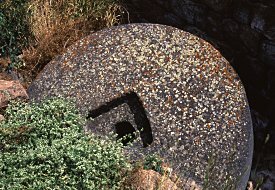 There are hollows cut into the ends of these blocks, revealing that they originally were part of a structure built using the masonry technique where large blocks of stone are held together by iron "dove-tail" cramps set in lead. 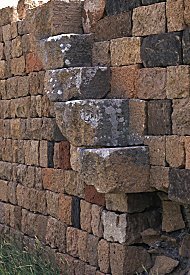 In Armenia, this method of construction is found in buildings from the Arsacid period (the first to the fourth century AD). 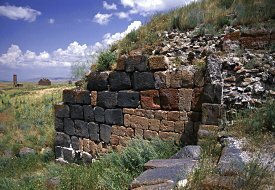 These stone blocks may have been taken from parts of the Zoroastrian "fire temple", or from another building of the same or an earlier period. Very little of this stone is reused in other parts of the citadel, suggesting that the stone was brought to the citadel from another location, and the fire temple is the most obvious site. To the left of the rectangular tower is a stretch of the citadel wall [c] whose masonry facing seems to be surprisingly fresh in appearance (see photograph 6). This is probably an unrecorded reconstruction from the time of Marr's excavations. 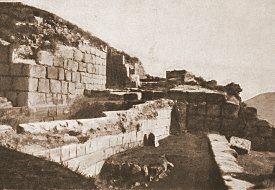 In 1907, on the slopes of the citadel, fragments of a Greek inscription were found. It had probably fallen from the citadel, and must have dated from the brief period of Byzantine rule at Ani. Basmadjian mentions finding, in 1903, a fragment of a Greek inscription in the citadel - perhaps the same inscription. Within the citadel ramparts are the extensive ruins of a palace [d] that occupied the highest part of the citadel hill, the ruins of at least five churches [e, f, g, h, i], and the ruins of several unidentified buildings. 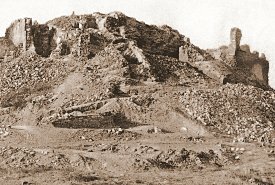 Today, there are the visible remains of three churches within the citadel: the "Church of the Palace" [e] , the "Mausoleum of the Child Princes" [f], and the "Hexagonal Church of the Citadel" [i]. 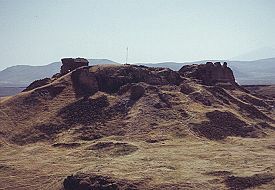 This palace, [d] on the citadel plan, Marr-Orbelli site 109, was the residence of the Bagratid rulers of Ani, their successors, and probably also their predecessors the Kamsarakans. Click here to go to a page about the palace. The "Church of the Palace"
This structure, [e] on the citadel plan, Marr-Orbelli site 109a, lies within the palace enclosure. Click here to go to a page about this church. 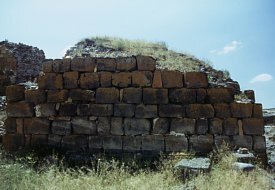 The "Mausoleum of the Child Princes"
This structure, [f] on the citadel plan, Marr-Orbelli site 110, is located below and to the south-east of the palace. Click here to go to a page about this church. 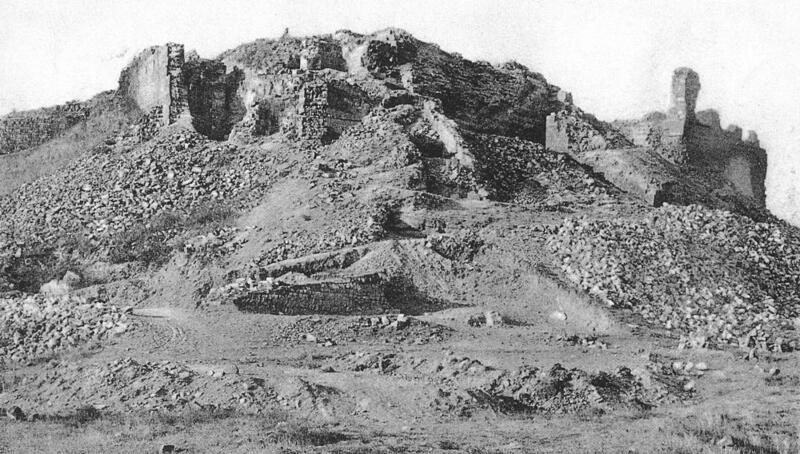 The "Hexagonal Church of the Citadel"
This structure, [i] on the citadel plan, Marr-Orbelli site 114, stands at the extreme southern end of the citadel. Click here to go to a page about this church. Structures [g] and [h] on the citadel plan are also churches. Structure [h], Marr-Orbelli site 113, is now so overgrown and ruinous that it is hard to distinguish. Structure [g], Marr-Orbelli site 112, which lies on the slope of the citadel hill, is now just a pile of fallen masonry. It is known as the "tetraconch church of the citadel", and enough of it was standing at the start of the 20th century for Toros T'oramanian to make a plan of it. It had four apses contained within an irregularly shaped exterior. Two side rooms flanked the altar apse, and the entrance was on the west facade. It was a fragment of this church that was noticed and photographed by Lynch in 1893 (see figure 84 in his account of his visit to Ani). This page [Ani citadel] was first published in 1999. It was last modified on the 18th April 2005.